Help Mr. Bravado retrieve the ancient artifact from Torch Cave and more importantly - help him get out of there alive! Revel in a brilliant story, fast-paced puzzles and thrillingly designed levels in reportedly the first adventure of the action adventure platformer saga about Bob, a truly brilliant fellow from Sekotwana! Yury is a deliberately retro platform/arcade action game that combines old-school graphics, classic mechanics and challenging gameplay with a sense of sci-fi survival horror atmosphere. On A Roll 3D is a fast, colourful 3D platform game. Roll your way through 24 huge levels across six different themes and be prepared to take on spikes, mines, dynamite, conveyor belts, springs, switches, doors, bumpers, lasers, saws, fire, ice, water, electricity, trapdoors and much much more. 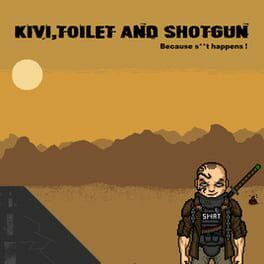 Kivi, Toilet and Shotgun is a single player top down action game where your goal is to reach the end of the desert by avoiding all kinds of obstacles and fighting the desert raiders. Go up against foes in your vehicle and on foot. Take on powerful bosses, but make sure you're quipped for the fight!